It does not get more Vegas than having exquisite specialty drinks inside a giant crystal chandelier – and that is exactly what the Chandelier at the Cosmopolitan of Las Vegas is all about. Situated inside the Cosmopolitan hotel, this bar and lounge consists of three separate stories, each housing their own setup, atmosphere, and speciality drinks menu. If you are excited by the thought of having handcrafted drinks inside a beautiful setting, then look no further than the Chandelier bar inside the Cosmopolitan of Las Vegas. Designed by the Rockwell Group and Focus Lighting, this 10.000 square foot space is divided into three levels, includes five bars, most of them within the giant crystal chandelier structure – Level one is situated underneath the chandelier structure itself. Made out of 21 miles of crystal bead swags, with a total of seven million crystals, it is a magical sight when the specially made digital projections are cast on the millions of reflective surfaces, creating a fantasy atmosphere out of your wildest dreams. 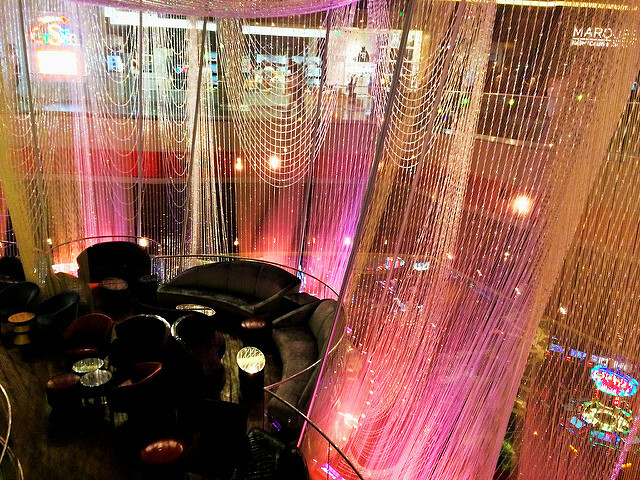 Even though the three levels of this bar and lounge all have the chandelier in common, each level is different, with their own atmosphere and seats – level 1.5 and 2 contain both lounge options as well as bars, where the first level resembles the style of casino bar. Each level even have their own separate drinks menu, made by mixologist Mariena Mercer, a chemistry student gone bartender with a passion for mixing her crafts to make the most inspiring and personal drinks. The cocktails lie within the price range of 16-20$, but according to reviews, their delicious taste, as well as the craftsmanship and imagination put into them is worth the extra cash. The names of each cocktail might provide an extra amusing experience as well, as most are named with references to pop culture and literature, like the bourbon based “Whiskey Business”, found on level 1, or the multi sensory experience, Willy-Wonka inspired “Schnozberries taste like Schnozberries” on level 1,5 (drinks menus included further down). The Chandelier bar and lounge also offers secret drinks (ask the bartender and you shall receive) as well as three signature drinks: “The Forbidden Fruit” – an apple based cocktail, an upgraded version of an “Old Fashioned” named “the Infinite Playlist” and finally a cocktail named “Verbena” which mixes the sweet lemon of verbena with a fiery ginger and a little bite of a szechuan pepper before drinking the cocktail for an intense aromatic experience. Bathed in light, crystals and background music (with the occasional live band) the Chandelier is available for anyone to enter and experience. The delicious and imaginative cocktails, as well as the other alcoholic beverages served, are reserved for the visitors over 21. The guests who have enjoyed going to the Chandelier all report of its great atmosphere and decor, as well as the deliciousness of their drinks, both on Yelp and Tripadvisor. There is an agreement however, between the reviews with ratings both high and low, that the drinks are a tad pricey, but that other things about the Chandelier generally makes up for the expensiveness. Overall it seems that despite the high price of the drinks, the Chandelier is worth a visit if you find yourself at the Cosmopolitan of Las Vegas. If you want to know even more about the magnificent Chandelier Bar please visit Cosmopolitan Hotel Resort & Casino official webpage here.